After literally bringing some grub to feed his young a male Western Bluebird leaves the nesting box and perches on a fence pole in search of more food for the rapidly growing brood. We watched as both the male and female shuttled food in and waste out of the nest box with their young still safely tucked away inside. 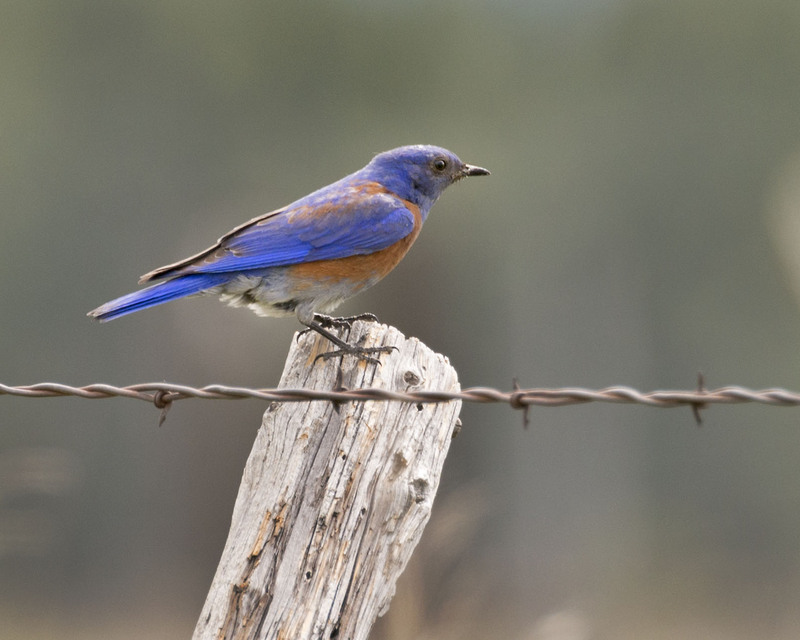 The Western Bluebird is not as common as the Mountain Bluebird so it is always a pleasure to see that brilliant blue and orange. A fine way to start a summers day. I totally agree and unfortunately the photos of the female we a bit blurry but she was a looker as well. He was not on a 40/week work schedule. Overtime without pay. He sure was and a busy guy as well. Hope your day is going well. We see more mountain bluebirds here too. Nice shot of a gorgeous bird! Yes the Mountain Bluebird is what we are accustomed to seeing so this guy was indeed a treat. What a beautiful creature! I’ve never seen these. Hi and glad we could show you one. He is quite a colorful fellow for sure. It is, so vibrant. I always am a bit astonished when I see blue colored birds and the sheer purity of that blue.